1 Corinthians 5:6, Purge out. The greater context of this passage is about putting sin out of our life (which is the temple of YHVH’s Holy Spirit, 1 Cor 3:16–17), which collectively form the spiritual body, church or the greater temple of Yeshua’s spiritual body (John 2:21). Therefore, sin that defiles the temple of Elohim must be put out of the church. In this letter to the Corinthians, Paul is especially concerned about the sin of sexual immorality that the church in Coringh had allowed to come into its midsts (1 Cor 5:1ff). 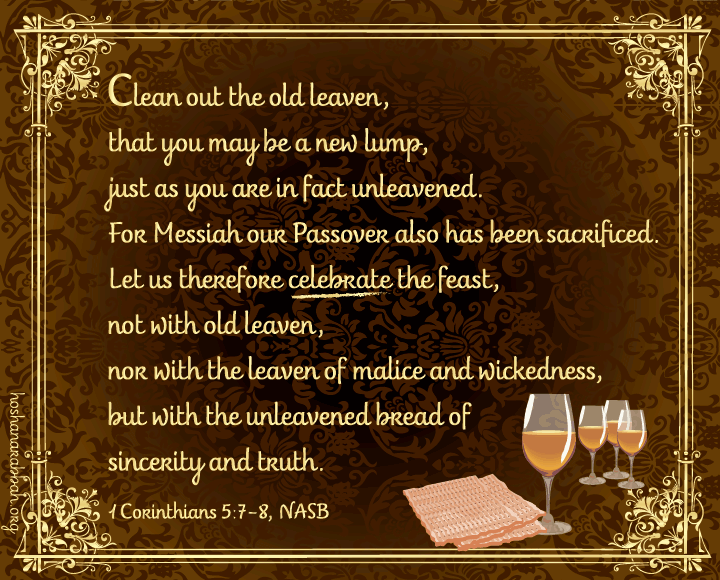 From the context of this passage in light of Paul’s discussion about Passover and the Feast of Unleavened Bread, it would appear that he wrote this letter just prior to the spring festivals (1 Cor 5:6–8). He is urging the church to remove the leavening of sin from its midsts prior to keeping the Feast of Unleavened Bread, which he, by the way, urges the Corinthian believers to do. In fact, Paul’s admonition to “keep the Feast [of Unleavened Bread]” in verse eight, is the strongest imperative command in the Testimony of Yeshua (or NT) to keep the biblical festivals, and from this it’s evidence that in the mind of the apostle the biblical festivals were still relevant to Yeshua’s followers well past the middle of the first century, which means they’re relevant to the saints of today as well. In his admonition to the Corinthian believers, it’s possible that Paul had in mind two examples in the Tanakh where spiritual revivals occurred after Hezekiah and Josiah cleansed the temple in Jerusalem of the filth of idolatry in preparation for Passover. Similarly, Ezra finished completion of the rebuilt temple in time to celebrate Passover (Ezra 6). These examples teach us that YHVH commands us to cleanse or deleaven our spiritual temples (individually and collectively) of sin annually in preparation for celebrating Passover and the Feast of Unleavened Bread. This spiritual spring house cleaning at the beginning of the biblical new year sets the tone spiritually for the rest of the year to go forward in a sin-free state. ChaMatzot or the Feast of Unleavened Bread is the second annual festival on YHVH’s biblical calendar, and occurs on the fifteenth day of the month of the Abib, which is the day immediately following Passover (or Pesach, Lev 23:5–8). Because both of these feasts (Exod 34:25; Lev 23:2, 6) occur back-to-back, the Jews often refer to Passover and Unleavened Bread simply as Passover Week or some similar term that places the main emphasis on the Passover. But it must be noted that, though related, these two festivals are separate in meaning and purpose. Passover pictures Israel coming out of Egypt. Upon separating from Egypt, YHVH (the LORD) then commanded the Israelites to put all leavened food products out of their houses and to eat unleavened bread (flat bread) for seven days, hence the origins of the Feast of Unleavened Bread. Additionally, the first and seventh days of this week-long event are Sabbaths, and YHVH commanded his people to hold a set-apart convocation (or gathering) on these Sabbaths. What, you may ask, is the purpose of putting leavening out of one’s home and eating unleavened bread products such as matzoh for one week? This seems like a curious request by YHVH of his people. Not surprisingly, the Creator of the universe has a reason for everything. The spiritual implications are enlightening and highly relevant to the disciples of Yeshua. In commanding his people to de-leaven their homes and lives, YHVH is teaching us an object lesson that applies to us as much today as to the Israelites of long ago. 1 Corinthians 5:8, Leaven. What specifically is leavening? Leavening is primarily yeast that makes bread rise and, biblically, is the symbol for the sin of pride. 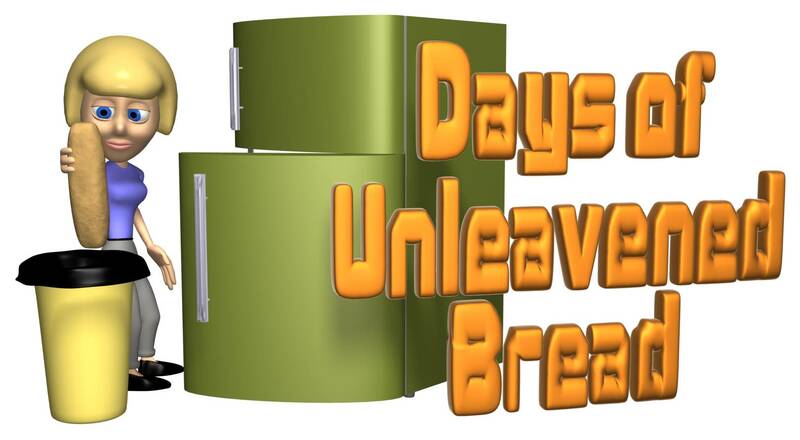 Leavening is also a symbol of decay. The rising of the dough is only possible by the natural process of decay. In ancient times, a pinch of fermented or sour dough was placed into a batch of unleavened dough to make it sour and cause it to rise. Yeast is a living micro organism that is classified as a fungi. Fungi feed on both living and dead and decaying organic matter. Yeast turns food sour through the process of fermentation and this begins the process by which something dies. Yeast is an apt metaphor for the corrupting influences of sin, which invades our lives and turns our souls from sweet to sour leading to spiritual death. Were it not for the curse of death because of Adam and Eve’s sin, it’s quite possible that fungi would not exist. Chag HaMatzot or the Feast of Unleavened Bread is the second annual festival on YHVH’s biblical calendar, and occurs on the fifteenth day of the month of the Abib, which is the day immediately following Passover (or Pesach, Lev 23:5–8). 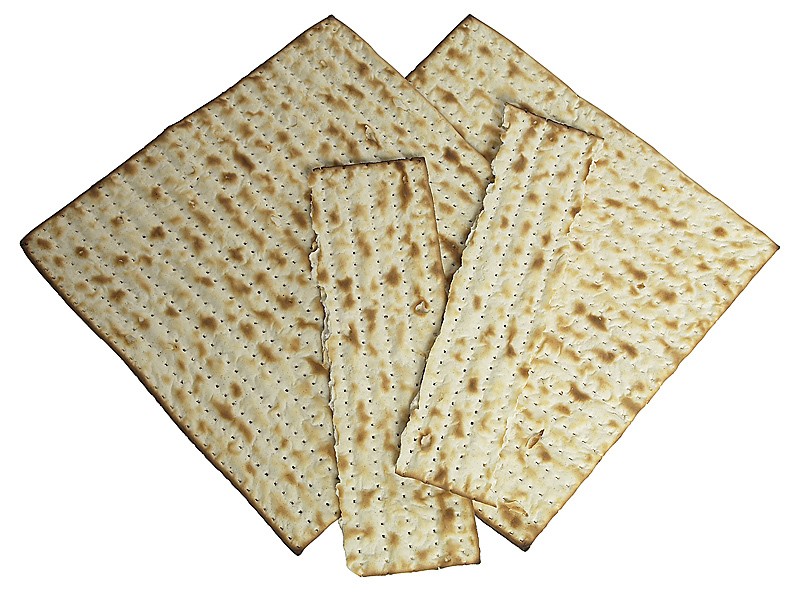 Because both of these feasts (Exod 34:25; Lev 23:2, 6) occur back-to-back, the Jews often refer to Passover and Unleavened Bread simply as Passover Week or some similar term that places the main emphasis on the Passover. But it must be noted that, though related, these two festivals are separate in meaning and purpose. Passover pictures Israel coming out of Egypt. Upon separating from Egypt, YHVH (the LORD) then commanded the Israelites to put all leavened food products out of their houses and to eat unleavened bread (flat bread) for seven days, hence the origins of the Feast of Unleavened Bread. Additionally, the first and seventh days of this week-long event are Sabbaths, and YHVH commanded his people to hold a set-apart convocation (or gathering) on these Sabbaths. Eating unleavened bread for seven days is a memorial, remembrance or reminder (Exod 13:6–9) of our coming out of our own spiritual Egypt. But how did unleavened bread enter into this picture? The Torah tells us that the Israelites left Egypt early in the morning as they were making their daily bread, and because they left in haste the bread was not able to rise (Exod 12:34). Therefore, they were forced, by circumstances, to leave their leavening — a biblical metaphor for sin — behind in Egypt. Similarly, believers in Yeshua are commanded to keep the Feast of Unleavened Bread (1 Cor 5:6–8), which helps to remind us that we should have left our old sinful ways behind us in the spiritual Egypt of this world when we surrendered our lives to Yeshua. We are pressing onward to the Promised Land of YHVH’s eternal kingdom. Not only did YHVH command his set-apart people to leave Egypt (a biblical metaphor for this world and its godless ways), but he wanted his people to separate themselves from and leave behind in Egypt the rudiments of this world, or sin, which defiles them and separates them from a set-apart and sinless Elohim (God). Leaven is a picture of this, as we will see more clearly below.